A study concludes that the body's natural rhythms may influence the likelihood of breast cancer. Catherine and Dan discuss language from this story. Researchers have found that the body's natural rhythms affect the likelihood of breast cancer in women. Which is a synonym of biorhythm? 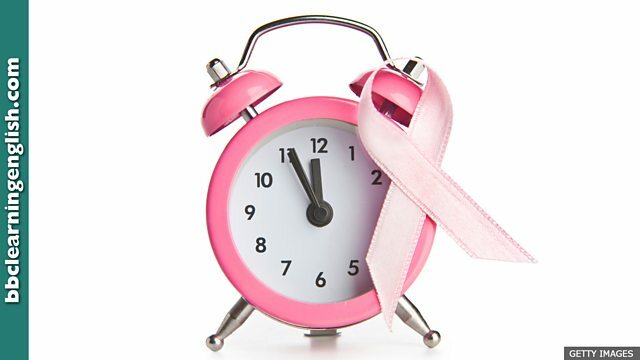 British scientists have discovered that women who naturally get up early are less likely to develop breast cancer. After an eight-year study, research has concluded that among early risers, only one in every 100 women develop breast cancer. This rose to two in every hundred for women genetically programmed to go to bed late and get up late. The scientists say the research provides further proof that a person's body clock and sleeping patterns affect their health. • I've never been one of the larks. I'd much rather sleep all day and party all night. • She's always been a morning lark. As an artist, she's most creative in the morning. • James might be the chirpiest person I've ever met. Have you ever seen him sad? • The surprise birthday party left him feeling much chirpier about turning 40. • There's a bit of a mismatch between our budget and your business plan. Sorry! • Despite seeming to be a total mismatch, they love each other very much. What is the correct spelling of this word, which means 'happiest and most active'? A morning lark is a person who gets up very early and has lots of morning energy. What is the opposite of 'a morning lark'? Which word is the most informal?